Microsoft Azure Site Recovery (ASR) offers Disaster Recovery as a Service (DRaaS) for applications running in Azure and on-premises. Using ASR, you can reduce application downtime during IT interruptions, without compromising compliance. ASR provides comprehensive coverage for on-premises applications across Linux, Windows, VMware and Hyper-V virtual machines, and physical servers. Azure Site Recovery now powers Veritas Backup Exec Instant Cloud Recovery (ICR) with Backup Exec 20.2 release. With ICR, Backup Exec users can easily configure continuous replication for on-premises virtual machines to Azure for a quick failover in case of a disruption on-premises. Backup Exec customers can minimize Recovery Point Objective (RPO) and Recovery Time Objective (RTO) for business-critical applications realizing the benefits of Azure as dynamic disaster recovery platform using ICR. Instant Cloud Recovery requires an Azure subscription and supports VMware and Hyper-V Virtual Machines. ICR provides a summary view, monitoring, replication health details, and key actions directly from the familiar Backup Exec console. You can go to Azure portal for advanced monitoring and failover operations. Backup Exec Instant Cloud Recovery to Azure is available in all Azure regions where ASR is available. 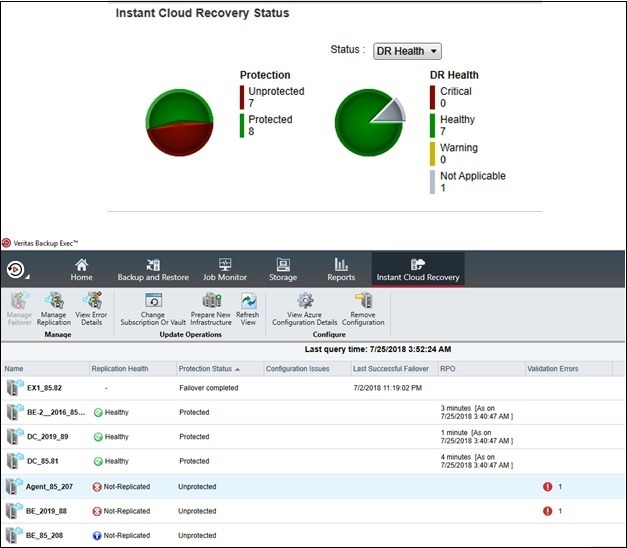 Get started by downloading the Backup Exec 20.2 trial version.